Indestructible Dog Toys: Dog Personality is Important! Voice Recorder Dog Toys – Two Great Options For This Dog Toy! New Ruff Tuff Dog Pools! Do You Need an Emotional Support Pet Letter? Dog Hormone Imbalance Can Lead to Tragedy! Mold and Dogs: Mold is A True Danger for All Pets! Cat Toys That Dogs Won’t Destroy Or Probably Won’t Destroy! 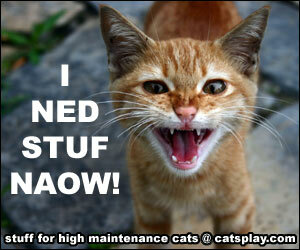 For Ruff Tuff Cats Only – A Lot Of Fun Items! Bird Feeder To Entertain Cats – Accidentally Found A Squirrel-Proof Bird Feeder! Honey my cat loves looking outside and I wanted to give her something to look at. My first try was a window bird feeder but birds did not appear the next day and I got a little impatient so Plan B was a regular bird feeder as one of the goals here was a Bird Feeder To Entertain Cats. My other goal was to feed both birds and squirrels. For the Bird Feeder To Entertain Cats, I chose the Pennington bird feeder like the ones here as they are made from recycled materials and cute. One thing about Honey is that she needs to be kept busy or she will get in trouble so a bird feeder or two definitely keeps her busy looking out the window as you can see in the photo above. A bird feeder to entertain cats is a great way to entertain Honey as now she spend a lot of time in the window watching birds and squirrels visit the bird feeder. I actually wasn’t looking for a Squirrel-Proof Bird Feeder. I was trying to create the opposite, a squirrel feeder from a regular bird feeder as where I live I saw a news segment about all the squirrels coming down with squirrel pox and felt bad for them so I wanted to feed them. After researching I modified my bird feeder to be a squirrel feeder too. I wanted it to be high off the ground so bears won’t be attracted to it. And I also wanted to entertain my cat and she was quite amused and happy. So the squirrel bird feeder worked fine for her and the squirrels and birds for quite a while so all was great until a little red squirrel moved in under my shed. At first I did know what was happening to the bird feeder as the damage was BIG and I thought at first maybe it was a bear but then thought it just can’t be. I was right as the next morning I looked out my window and saw the little red squirrel who I named Stinky attacking my bird feeder. I ran outside with my camera to take a video. And the video shows what happened to my bird feeder and how Stinky not only destroyed the top of it but the bottom as well. So I cleaned up the mess and moved the bird feeder to another part of the branch and hung it up on the branch with a dog runner cable so that it was 6 feet off the ground. And saw that Stinky could not climb down or jump up on it yet birds could come to it just fine so I ended up with a Squirrel-Proof Bird Feeder. So if you want a Squirrel-Proof Bird Feeder then what I did may help you. The problem was that I wanted squirrels to eat too. I removed the damaged top entirely and taped the bottom more and moved it down so it was 4 feet off the ground. Guess who was my first visitor after this change? Yes…Stinky! Here’s some pics of Stinky using the bird feeder and letting me get pretty close for a pic before he did a back-flip off….a pic of that too! So birds, squirrels and my cat are happy once again…and me too! UPGRADED Window Bird Feeder, Sliding Feed Tray, Large, Crystal Clear, Weatherproof Design, Squirrel Resistant, Drains Rain Water to keep bird seed dry! In The Spotlight: Not Just For Dogs: Introducing The Cat Pool With A Twist! Relieve Your Kitty’s Stress With Some Real Fun! While your kitty may not actually like to swim in a Cat Swimming Pool like a dog in a dog pool, most cats would enjoy the robo fish in one or a fish bowl with robo fish… I know my cat is fascinated with water. She spends a lot of time in a tub with a wet floor and tips over her water bowl constantly and sticks her paws in it so I’m definitely going to try some of these ideas on this page for her! Fun Cat Toys That Dogs Won’t Destroy Or Probably Won’t Destroy! In The Spotlight and New for Fall and Winter: A Wall Panel Heater That is Crack Resistant To Warm Your Pets, Kids and You!